The Jean Paul Gaultier Couture Spring/Summer 2012 Show is a homage to Amy Winehouse. Other Amy Winehouse-influenced collections : Chanel by Karl Lagerfeld Pre-Fall 2008 (« Paris-London », especially the chignons and the eyeliner), Comme des Garçons Autumn/Winter 2008-2009, Fred Perry X Amy Winehouse Autumn/Winter 2010-2011 (collection co-designed by Amy Winehouse, inspired by her own style). 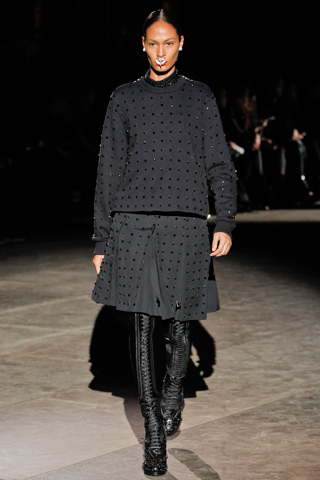 The Givenchy by Riccardo Tisci Autumn/Winter 2012-2013 Menswear Show (« American Dream ») is inspired by America. A selection of other collections that were inspired by America : Diane von Furstenberg Autumn/Winter 2011-2012 (« American Legends »), Dsquared² Autumn/Winter 2011-2012 (Far West), Hermès by Jean Paul Gaultier Spring/Summer 2009, Isabel Marant Autumn/Winter 2008-2009, Jean Paul Gaultier Spring/Summer 1989 Menswear (« Western baroque »), John Galliano Autumn/Winter 2006-2007 (Far West), Proenza Schouler Autumn/Winter 2011-2012, Ralph Lauren Spring/Summer 2011 (Far West), Vivienne Westwood Spring/Summer 1983 (« Nostalgia of Mud »), Yves Saint Laurent Couture Spring/Summer 1978 (« Broadway Suit »). Frank Gehry was one of the inspirations of the Nicole Fahri Autumn/Winter 2010-2011 Show. Other collections with Frank Gehry-inspired clothes : Dior by Bill Gaytten Couture Autumn/Winter 2011-2012, JS Lee Autumn/Winter 2010-2011, Monique Lhuillier Autumn/Winter 2007. The Memphis Group (especially Ettore Sottsass) is one of the inspirations of the Dior by Bill Gaytten Couture Autumn/Winter 2011-2012 Show. Other Memphis Group-inspired collections : Armani Privé Spring/Summer 2008, Peter Som Autumn/Winter 2011-2012, Vena Cava Spring/Summer 2011. The Ballets Russes (Russian Ballets) are the inspiration of the Anna Sui Autumn/Winter 2011-2012 Show. Other collections inspired by the Ballets Russes : Clements Ribeiro Autumn/Winter 2010-2011 (« Haute Bohemia»), Dries Van Noten Autumn/Winter 2011-2012 (parallels between Vaslav Nijinsky and David Bowie, era Ziggy Stardust), Erdem Spring/Summer 2011, John Galliano Autumn/Winter 2008-2009, Missoni Spring/Summer 2011, Wren by Melissa Cocker Autumn/Winter 2008-2009, Yves Saint Laurent Couture Autumn/Winter 1976-1977 (« Opéra-Ballets Russes »), Yves Saint Laurent Couture Autumn/Winter 1979-1980 (homage to Sergei Diaghilev). The Balmain Autumn/Winter 2011-2012 Show is inspired by David Bowie, era Ziggy Stardust. Other David Bowie-inspired collections : Costume National Autumn/Winter 2011-2012 (David Bowie and Twiggy), Dolce & Gabbana Autumn/Winter 2008-2009 (look 32 : face of David Bowie, era Ziggy Stardust, on a T-shirt), Dries Van Noten Autumn/Winter 2011-2012 (parallels between David Bowie, era Ziggy Stardust, and Vaslav Nijinsky), Dries Van Noten Autumn/Winter 2011-2012 Menswear, Jean Paul Gaultier Autumn/Winter 2005-2006 (David Bowie and glam rock), Jean Paul Gaultier Spring/Summer 2011 (David Bowie and Joan Jett), Lanvin Autumn/Winter 2011-2012 Menswear, Pollini Autumn/Winter 2008-2009 (David Bowie, era Ziggy Stardust), Richard Nicoll Spring/Summer 2011 (David Bowie, era Thin White Duke). The Aquilano.Rimondi Autumn/Winter 2011-2012 Collection is inspired by Piet Mondrian. Other collections with Piet Mondrian-inspired prints : Charlotte Olympia Spring/Summer 2010, Costume National Autumn/Winter 2011-2012, Yves Saint Laurent Couture Autumn/Winter 1965-1966.